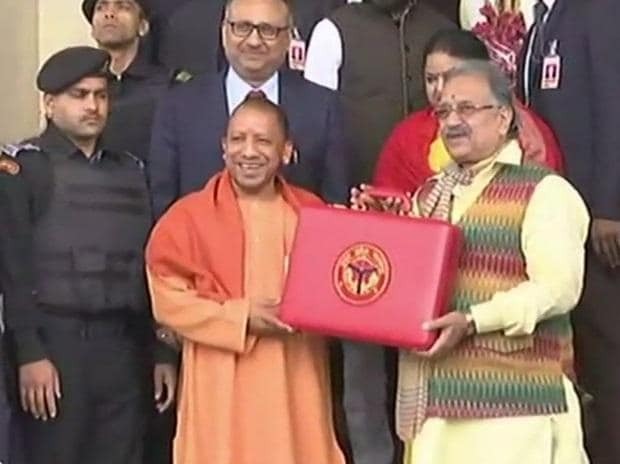 Yogi Adityanath government Thursday tabled Uttar Pradesh (UP) Annual Budget 2019-20 of more than Rs 4.79 trillion, which is almost 12 per cent higher than current year’s Budget of nearly Rs 4.28 trillion. The state, however, followed the fiscal discipline path and tamed fiscal deficit at Rs 46,910 crore or 2.97 per cent, which is within the mandated three per cent of the gross state domestic product (GSDP) under the Fiscal Responsibility and Budget Management (FRBM) Act. The government has estimated revenue receipt of Rs 77,640 crore from state goods & services tax (SGST) and value added tax (VAT). The excise duty kitty in 2019-20 is expected at a healthy Rs 31,517 crore. Considering this is an election year with Lok Sabha polls a few months away, the ruling Bharatiya Janata Party (BJP) government helmed by Adityanath has sought to provide liberal doses of funds to all the key sectors, especially agriculture, health, education, energy, social welfare department to keep the electorate in good humour. The government has also provided adequate funds for infrastructure and its flagship projects to ensure civil works are not affected since the model code of conduct would come into force once the dates for the Lok Sabha elections are announced. Meanwhile, the state has provided nearly Rs 600 crore for the setting up and maintenance of cow shelters in the urban and rural areas of the state. Addressing the media after the Budget was tabled in the UP assembly by finance minister Rajesh Agarwal, CM Adityanath noted the Budget carried forward the theme of ‘sabka saath, sabka vikas’ as coined by Prime Minister Narendra Modi in giving thrust to the farmers, workers, youth, women and other sections of society. He claimed although there was no obligation for the crop loan waiver scheme in the next fiscal, yet the agriculture department budget had increased by over 14 per cent over last year. For the construction of expressways, a budgetary provision of Rs 3,194 crore has been made in 2019-20, of which Rs 1,194 crore, Rs 1,000 crore and Rs 1,000 crore has been allocated for the proposed Purvanchal Expressway, Bundelkhand Expressway and Gorakhpur Link Expressway respectively. Besides, Rs 500 crore has been provided for land acquisition to develop the flagship defence corridor along Bundelkhand Expressway. A total of Rs 100 crore would be given for strengthening of the proposed Agra-Lucknow entry-controlled six-lane expressway project. Rs 1,000 crore has been given for construction, expansion and strengthening of airstrips in UP. Besides, Rs 800 crore has been allocated to acquire land for the proposed Jewar Airport in Noida, while Rs 200 crore has been earmarked for Ayodhya airport. A budget of Rs 150 crore has been given for providing air services under the UP Civil Aviation Promotion Policy 2017 and the Regional Connectivity Scheme. The Budget document projects total expenditure of Rs 479,701 crore, including Rs 363,957 crore and Rs 115,744 crore under revenue and capital heads respectively. Meanwhile, the Budget projects total receipts of Rs 470,684 crore, including Rs 391,734 and Rs 78,950 crore by way of revenue and capital receipts, respectively. The revenue receipts comprise Rs 293,039 crore through tax revenue, of which Rs 140,176 crore would accrue as tax mop up from own resources, while Rs 152,863 crore would come as the state’s share in the central taxes. The Budget expects a revenue saving of Rs 27,777 crore in 2019-20 with the closing balance estimated at Rs 8,708 crore, while taking the opening balance of Rs 8,225 crore into account.